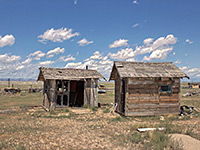 The tiny settlement of Cisco in eastern Utah was established in the 1880s as a service post along the Denver and Rio Grande Railroad (now Union Pacific), and flourished for several decades, attaining a maximum population of over 200, until a decline began, firstly after the replacement of steam trains by diesel engines in the 1950s, and then when the town was bypassed by Interstate 70 in the 1970s. This location is also notable as the site of an oil/gas field, discovered in 1924 and still sporadically active. 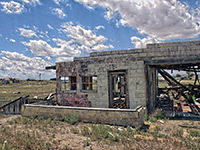 But the town itself is virtually uninhabited, with all or most of the remaining residents leaving during the last few years, so has become a ghost town, containing an array of derelict buildings, old vehicles and other debris, some quite modern. 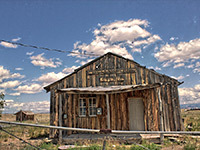 The relatively recent abandonment and proximity of the interstate mean that the place is not as unspoilt or atmospheric as settlements which have been empty for longer and are harder to reach, such as the many old mining towns of the Colorado Rockies, with their aged timbers and dramatic mountain setting; instead, the place has much litter and graffiti, but is still quite photogenic. 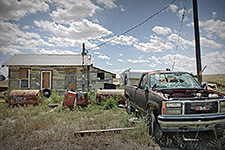 Cisco has featured in several movies including Thelma and Louise and Vanishing Point, representing a typical, semi-derelict, Western desert town. Cisco is easily reached along Old Highway 6/50, that connects exits 204 and 214 of the interstate, and which near its west end links with Hwy 128 to Moab. The town is about half way along, to the south, near the point where the railway crosses the road (a siding is still in regular use), and the approximately one hundred buildings are visible from some distance away across the flat, otherwise rather featureless surroundings, though in the distance are ranges of reddish hills and cliffs, including those enclosing the Colorado River close to the Colorado stateline. One side road forks southeast, signed to Cisco Landing and Fish Ford (both access points to the Colorado River), and many of the buildings are found along here. One group of structures on the far side of town seems the most likely still to be inhabited, at least for part of the year, and indeed a few others may be as well, though the vast majority have clearly been vacant for a long time. Cisco is apparently a semi-popular camp stop for cross-state travelers on the interstate, and this accounts for some of the trash and damage to the buildings.